“CoreLife is life”, a friend once told me. CoreLife is, according to their website, “focused on active, healthy lifestyles.” I’m not sure I’d put myself in that category, but I do like food so I had to check it out. In concept, it’s similar to Subway, QDoba, and other quick-service restaurants where you stand there and watch your food get made. Except in this case, instead of sandwiches or Mexican-ish food, you get “nutrient-dense” bowls of food with “warm organic whole grains” at the center. Or broth. The amount of vegetables on display was pretty impressive for a place where the time between ordering and eating is a minute or two. I ordered the Korean chicken BBQ bowl. 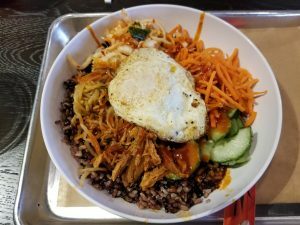 It’s essentially a fast-food version of bibimbap. In this version, the bowl isn’t hot enough to cook the egg, but that doesn’t stop it from being tasty. The portion was generous, too. I wasn’t quite able to finish my bowl despite being pretty hungry by the time I got there. Even though I felt full, I didn’t feel overstuffed and I was able to convince myself that I had what amounted to a fairly healthy lunch. You won’t find a Coke fountain at CoreLife, but they do have a wide array of juices, teas, and lemonades. I chose the honey ginger lemonade, which claims to be good for detoxes. I don’t know if I felt any less toxified afterward, but it was a tasty drink. CoreLife may be a chain, but it’s a little different than most of the other restaurants here in town. Even if you don’t live an active, healthy lifestyle, it’s a nice step out of the ordinary.